June is traditionally the month for marriage. The folks over at Samuel Adams Brewing Company in Boston, Mass. recognize this and have brewed up a very special, one-of-a-kind beer to commemorate this traditional month of matrimony. And, if the mood strikes you, they will even let loving couples exchange their vows in the brewery. 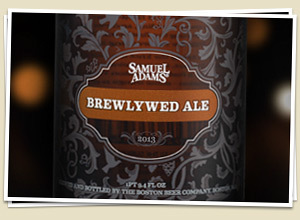 But, in order to get your hands on the brew, dubbed Brewleywed Ale, you will have to appear in person at the Samuel Adams Brewery in Boston on Wednesday, June 26. So, if you are not currently in Boston, you may have a hard time getting your hands on the limited release brew. Last year Sam Adams started this new tradition of celebrating the union of two people by brewing its first batch of the Belgian-style “bride ale.” Beer has been a traditional part of weddings for millennia. In fact the word honeymoon describes the ancient practice of supplying a newly-wed couple with mead – or honey beer – for the first moon, or month of their marriage in hopes of a swift conception. In addition, the medieval word “ale” comes from the word “bridal.” No wonder beer is such an integral part of weddings! If you are lucky enough to be in the immediate vicinity of the brewery for the release of Brewleywed Ale, and happen to have a valid Massachusetts marriage license, the folks at the brewery would be pleased to help you tie the knot. a Justice of the Peace available to perform ceremonies on the spot while string quartet Maestro Musicians serenades couples in the background. Need a Best Man (or Maid of Honor)? Jim Koch, founder and owner of Samuel Adams, will be on hand to witness your special day. If you are just there for the beer, you can pick up the 750 mL bottles for $14.99 at the brewery, June 26 only. Today is the last day in our lifetimes that there will ever be a triple date day. That means that the next time there is a date where all three numbers are the same will not be until January 1st 2101 – 01/01/01. Today is also the likely the last day you will be able to purchase the Holy Grail of beers, Westvleteren 12, legally in the US. If the crowds at Total Wine this morning are any indication, that is. It was wet, rainy, and slightly chilly at 6:00 a.m. when I arrived at the Total Wine in Jacksonville, Fla. But, I was not the first intrepid beer aficionado to arrive. In the pre-dawn hours of what I like to call Westie Day, there were already about 12 in line before me. Why would anyone stand out in the cold rain in December to buy beer? Because Westvleteren 12 is no ordinary beer; it is, as I mentioned above, the Holy Grail of beer. Add to that fact that it is also one of the rarest beers in the world as well as considered one of the best beers in the world, and you have a recipe for what is one of the biggest events in recent beer history. The event is so big that it even made it on NPR this morning. According to the story on NPR and And, Mark Bode, the brewery’s Westvleteren, this unprecedented event is not likely to repeat. “I think it will be the last,” said Bode. And since visitors are not allowed in the Abbey, he is the authority on the monks’ views. “They say, ‘We are monks, we don’t want to be too commercial. We needed some money to help us buy the new abbey and that’s it,’ ” Bode expounds. The brew, which is selling for $84.99 a six-pack including two special chalices, was made for export this one time due to a dire need to repair the roof of the Abbey in Belgium. Since monks take a vow of poverty, they do not have cash reserves for the needed repairs and released the brew to finance the repairs. The regular method of obtaining the brew is, well, arduous at best. Even the most ardent of beer-lovers could get discouraged by the process that requires apostles of the brew to call a special telephone number that may, or may not be answered. If, after multitudes of calls (some report that it can take months to get through to the Abbey) you are lucky enough to get someone on the line, you are told when you can come and line up for beer. But, that does not mean you will get the brew, only that you have the right to stand in line on that specific day. You may find, when you get to the front of the line, that they have sold that day’s allotment of Westies. The brew is so rare because the monks only produce enough to support the Abbey. That equates to less than 4,000 barrels a year. The monks are adamant that they are not producing beer to make a profit, only to support their day-to-day needs. They also ask all who purchase the beer at the Abbey to sign an affidavit that states the beer will not be resold at a bar or beer shop. This rule is often technically followed by beer sellers in Belgium who will include a “free” bottle of the brew with a beer purchase or shipment of a certain dollar amount. Not long ago the news that one of the world’s rarest beers, Westvleteren 12, will be released for sale next week. In the video below I talk about this extraordinary beer on “I Know Jax” with my cohort Joe Talentino. In January of this year I wrote an article with news that was huge for United States beer lovers. News that I compared to, “Elvis is still alive and munching peanut butter and ‘nana sandwiches. It’s as if you found a lotto ticket on the ground only to discover it is the jackpot winner. It’s like waking up between Olivia Wilde and Scarlett Johansson.” And I was not kidding, it was big news for the U.S. But, the beer that I have today is just as big for Jacksonville beer drinkers: fellow Belgian beer lovers rejoice! Westvleteren 12 will be available for purchase on Dec. 12 at Total Wine in St. John’s Town Center. Yes, you read that right, the Holy Grail of the beer world is coming to little ol’ Jacksonivlle. There will be no tickets to purchase, no reserving of the beer, and you cannot order it over the telephone. You have to go to the store on Dec. 12 to purchase the brew. you may remember, while I was visiting the Belgium in 2010, I stopped into a quaint 400-year-old tavern called Au Bon Vieux Temps owned by a lovely – and lively – woman named Marie. As I perused the menu and ordered beers, I became friends with Marie and we began talking about my beer writing activities. With a glimmer in her eye, Marie asked if I had ever tried a Westie. I replied that I had not. When she asked if I would like to, I wondered exactly who in the bar I would have to bump off before I got my hands on one of those extremely rare brews. I, of course, blurted that I would LOVE to try a Westie. 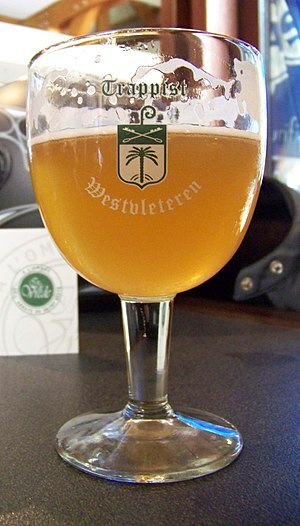 Westvleteren is brewed at the Trappist Abbey of Saint Sixtus of Westvleteren in Belgium. But, that had not always been the case. 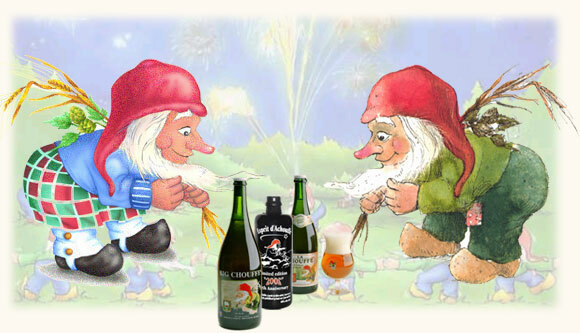 Monks from the Catsberg monastery in France founded the St. Sixtus monastery in 1831 and began brewing beer in 1838. At that time beer was brewed for the consumption of the monks, guests, and visitors only. But in 1931, the abbey began selling beer to the general public. The beer is sold only to support the monastery and other charitable causes. In October of 2011 it was announced that the beer would be more widely available for a very limited amount of time in order to temporarily increase funds for urgent and immediate renovations at the monastery. Only 93,000 cases of the beer would be available and those were to be packaged into a six-pack with two glasses. In November U.S. importers Shelton Bothers and Mannekin-Brusel announced that they would have limited quantities of the beer available in the gift packs beginning in April. That date stretched to June and, for Jacksonville, December. Many consider the Westie 12 to be the best beer in the world. Indeed in June 2005 during a bi-annual competition, Westvleteren 12 was voted “The Best Beer in the World,” by the members of RateBeer.com. Critics and beer afficianados alike agree that this brew is sublime. Of all the beers I tasted in Belgium and throughout my life, I would have to agree that it is my favorite beer in the world. But, as is the case in most things, opinions tend to be subjective. Some reviewers attribute the moniker to the rarity of the beer and certainly that is part of the allure. But, for taste, balance and character, I still stand by my assertion of it being my all-time favorite and worthy of being called the best beer in the world. This is a beer you definitely want to get your hands on because you may never get an opportunity to obtain it again. Certainly you will not be able to get it in a gift pack here in the states and probably not unless you go to Belgium and stand outside the abbey in hopes of scoring a case. Total Wine will offer the six-packs packaged with two logo chalices for $84.99. If you are lucky enough to snag a six-pack, be sure to share it with good friends who will truly enjoy this exceedingly wonderful and rare brew.